Few pleasures rival a sunset walk down a wide, sandy beach that is unspoiled by tourists and overdevelopment. Many expats dream of retiring in a place where such strolls are a daily occurrence. The problem lies in finding an affordable community that is not too isolated from the basic conveniences expats desire. For those seeking this balance of affordability and comfort, Ecuador merits a serious look. 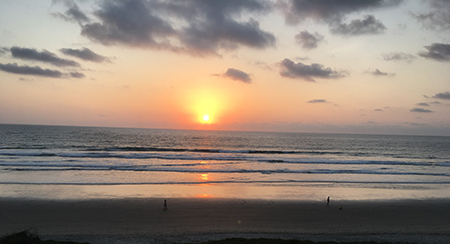 When thinking of Ecuador’s coast, the well-known destinations of Salinas, Playas, and Manta come to mind. However, by traveling a little off the beaten path, it is possible to find some tranquil coastal living options at attractive prices. One such option is Olón. Olón is situated 90 minutes north of Salinas, and the nearest major airport is in Guayaquil. From Guayaquil, it is roughly a three-hour drive to Olón. much more prevalent during those months. On the other hand, the weather will feel cooler during the remaining months, when overcast skies are the general rule. For me, a desirable beach destination has a few restaurants and a couple of stores, but is not overrun with tourists and traffic. Olón fits the bill. While the selection of restaurants is limited, there are plenty of options for those of us who would rather not cook. Additionally, visitors will find countless dining possibilities in nearby Montañita, which is a five-minute cab ride from Olón. Olón is a charming town with friendly people. As one person described it, it is like being back in the 1950s. I realized this was true as I wandered around the town square one Saturday night and found much of the community socializing as children gleefully played on the square’s playground. It is a safe town, and I felt quite comfortable venturing out alone at night. 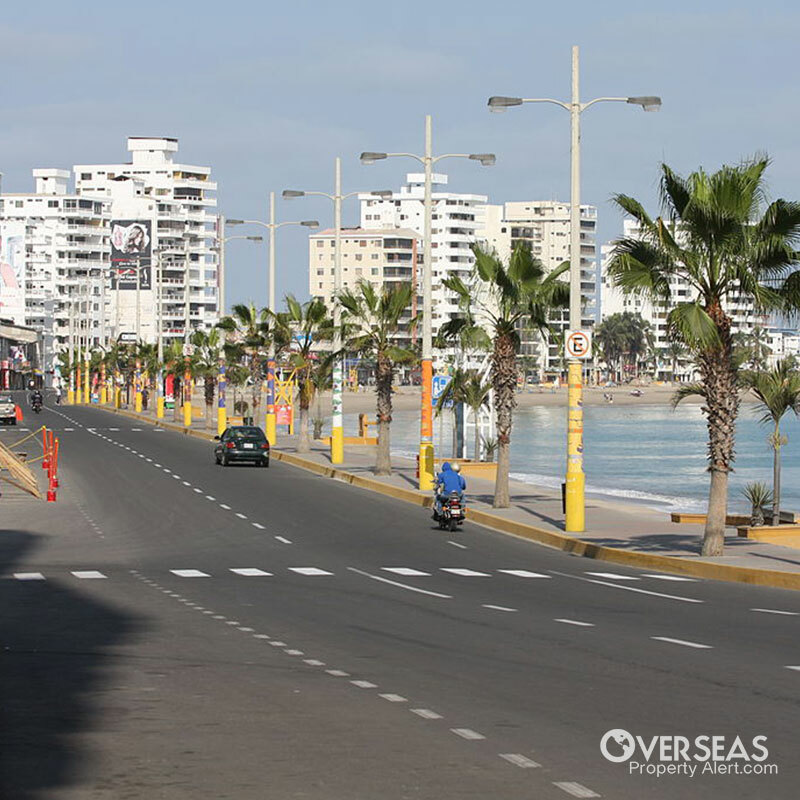 Olón has a beautiful, wide beach that is perfect for walking. 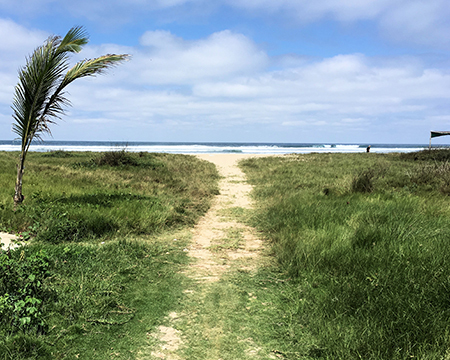 The sandy beaches of Olón stand out compared to the rocky and narrow beaches found in some of the areas closer to Salinas. Food is a bargain. For example, I enjoyed a filling almuerzo (lunch) consisting of a large bowl of soup, a generous portion of chicken, rice, a small salad, and a drink for three dollars. Fresh, inexpensive seafood is plentiful. It is not necessary to have a car. The town itself is walkable. For longer trips, transportation is readily available. Taxis constantly pass by on the main road that passes through Olón. Similarly, it is quite easy to flag down buses headed south to the larger cities of Montañita, Ballenita, and Salinas. For those choosing to drive, the primary roads are in good shape. However, dirt roads are common within the cities themselves. Between April and November, sunny days are scarce. I spent two weeks in Olón in October, and the weather was overcast most days. I am no fan of cloudy weather, but I found the weather to be pleasant. The cloudy days made the occasional sunshine even more enjoyable. It is a long trip to get to Olón. First, flying to Guayaquil likely will require connecting flights for those coming from the United States. (Nonstop service from the United States is limited to Miami, Fort Lauderdale, and New York.) From the Guayaquil airport, it is approximately a three-hour drive to Olón. There are very limited amenities. There are no ATMs. There are many places to eat but little variety. Although there are small stores in Olón that provide essential groceries like eggs, meat, and fruit, the nearest supermarket is an hour to the south in Ballenita. Hardly anyone takes credit cards in Olón and the surrounding area. In fact, it is best to have small bills, as taxi drivers and businesses often lack change for 20-dollar and 10-dollar bills. An added annoyance is that some businesses and taxi drivers are very picky about the bills they will accept and will reject bills with imperfections. Here are a few examples from the local real estate market. I viewed a cozy oceanfront condo with a living space of 90 square meters (968 square feet). It has two bedrooms and one bathroom with a decent ocean view from the living room. The asking price is US$99,000. A little closer to the center of town, I viewed a condo project with an expected completion date of Dec. 31, 2016. One example from the project is a third-floor unit with three bedrooms and three bathrooms. The unit is 155 square meters (1677 square feet) and has a nice ocean view. The building is just steps from the beach and close to restaurants and stores. The asking price is US$170,000. A 400-square-meter (4305-square-foot) building lot is available close to the beach and town. The lot is flat and, with the right house design, could provide an ocean view. The asking price is US$65,000. For a more economical option, there is a new condo building in Manglaralto, which is about 10 minutes south of Olón. A 40-square-meter (430-square-foot) unit with one bedroom and one bathroom is available. The asking price is US$43,000. This unit does not have an ocean view but is located just a few steps from the beach. Old-fashioned search methods work, as well. Opportunities are everywhere, so walking and driving around are great ways to uncover hidden gems. For example, I purchased an oceanfront lot that was advertised with spray paint on a dilapidated building. If you are looking for a real estate agent who works with properties in Olón and the surrounding area, I recommend Gerald Brokate. Gerald and his wife Laurie worked tirelessly to help me find exactly what I wanted. Gerald can be reached here. Olón is perfect for someone who is looking for a tranquil beach environment. It is not for those who require fine dining, shopping malls, and other big-city comforts. Those who are accustomed to vibrant social lives probably would not enjoy living in Olón full time, as it is a very small town. Although there are a few expats around who speak English, those who do not speak any Spanish likely will feel isolated. Some basic conversational Spanish skills will go a long way towards unlocking all that Olón has to offer. Those whose main objective is investment will want to exercise caution. While there may be some good opportunities for earning rental income in the Olón area, I could not find enough data to convince me that it would be advisable to purchase a property for the sole purpose of producing rental income. With some searching, it is possible to find good property deals with the potential for capital appreciation. 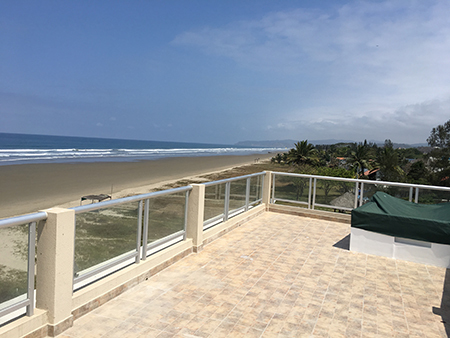 The best approach for the Olón area, in my opinion, is to buy a property you will enjoy using that also may provide some rental income when you are away and capital appreciation when you sell. Those seeking a laid-back coastal lifestyle at bargain prices should consider an exploratory trip to Olón. Editor’s Note: Brett Thompson is a teacher and attorney from Anderson, South Carolina. He loves visiting Latin American countries and has been to Mexico, Costa Rica, Nicaragua, Panama, Colombia, Ecuador, and Chile. I first met Brett at our Global Property Summit, and know him as a fellow real estate investor and overseas property owner. I hope to be seeing more from Brett as he travels around Latin America. I think I would like to move to Mexico, but first I need to know what their requirements are regarding residency and money. How much income is required, or how much money must be deposited in a bank? I’m 71. How long could one stay on a visitor’s visa? Thanks for all that you do. There is no other service like yours that I know of. Mexican residency is the easiest and fastest I’ve seen… and I’m familiar with the process in quite a few countries. The income requirement is US$1,300 per month, according to the Mexican Consulate in Phoenix. Alternatively, you can show that you’ve had at least US$21,500 in savings for the past 12 months. There are also options for property owners and investors. I obtained Mexican residency recently, and it took only 20 minutes… a feat you won’t match anywhere else. If you want to live in Mexico part-time, you can stay six months as a tourist just by showing up. In your article on the four best countries for retiree emigration, you mentioned “dependents” a couple of times. I am wondering if this includes adult children… how is “dependent” defined… and what restrictions and benefits there would be for them (other than my company!). Thank you so much. I just discovered your website, and just in time! The situation for dependents depends on the country. In my experience it almost always includes parents and children under 18, often with exceptions for handicapped children who can be older. I’ve also seen adult children of any age included. Many countries (maybe most) now allow domestic partners. Peru was strange… they count boys as “dependent” if they’re under 18, but girls are “dependent” at any age. As to benefits, any legal resident will typically have the same rights as citizens, including those who come as dependents. You won’t have the right to vote and may not have the right to work… but, otherwise, dependents are usually treated like the primary visa holder. Most often, it’s best to decide on the country that works for you… then decide how to get everyone there legally; immigration attorneys can be quite creative. What is your take on the future of Nicaragua given the political turn of events? We had decided to make this wonderful country our retirement home—found two gorgeous beach homes. But now we are concerned about investing and losing after Ortega takes office. We have Nicaraguan friends who assure us things will go on as always, expat groups who have divided opinions, and American friends in the United States who say we are nuts to still consider Nicaragua… that they could seize foreign owned property! Also, do you think the price of real estate will drop there after the election or will the market just go on as if nothing has happened? Thank you most kindly for your help—we have only so much to invest, and to lose it would court disaster. The bottom line is that nothing is changing in Nicaragua as a result of the recent election and the reelection of Daniel Ortega. It will be his fourth term, so there’s not much new about it. Daniel Ortega was the country’s leader from 1979 through 1985 and was their democratically-elected president from 1985 to 1990. He was elected again in 2006, 2011, and most recently last week. I have no reason to think anything will change. As to property prices, I believe things will be stable. Nicaragua’s property market was on fire between 2003 and 2008, but has been fairly stable post-recession. I don’t think prices will come down (certainly not because of the election), but I don’t see them going up dramatically either. Have a question? You can write to Lee (or Brett) here. Brett Thompson is a teacher and attorney from Anderson, South Carolina. He loves visiting Latin American countries and has been to Mexico, Costa Rica, Nicaragua, Panama, Colombia, Ecuador, and Chile.